Detail of portrait of Solomon Isaacs in unifrom, around 1916. Born in 1894, Solomon Isaacs grew up in the village of Tautu on Aitutaki in the Cook Islands before migrating to Auckland as a teenager. In October 1915, while living in Northcote and working as a labourer, the 20-year-old enlisted to serve in the First World War. Had his years in this country strengthened his ties to New Zealand and the empire? Did he want to explore the world? Whatever his reasons, Solomon left New Zealand in February 1916 with the 3rd Maori Reinforcements – a unit made up of Māori and Pacific Islanders. Solomon would serve overseas for eight days short of three years as a member of the Pioneer Battalion and New Zealand Tunnelling Company on the Western Front, and with the Rarotongan Company in Palestine. Solomon had been in Egypt with the New Zealand Pioneer Battalion for only two weeks when orders came in April 1916 to leave for the Western Front. Here, during difficult, dangerous labouring work – particularly building vital communications trenches – Solomon witnessed fellow Pioneers felled by artillery and sniper fire. During raids conducted by the Pioneers, Solomon was armed with hand grenades as a company bomber. On top of the day-to-day hardships and danger, Solomon struggled with the stodgy rations and the terrible cold. Accustomed to a tropical climate and fresh food, most Pacific Islanders fell ill – and Solomon was no exception. In September 1916 he was struck with trench fever, a severe (though rarely fatal) illness spread by body lice that causes headaches, skin rashes, inflamed eyes and leg pain. It took him a month to recover, mostly in England, so he missed the Somme offensive before rejoining the Pioneers. A portrait of Solomon Isaacs in uniform shortly before departing for Egypt with the 3rd Māori Reinforcements, February 1916. Image courtesy of Isaac Solomona. Solomon Isaacs’ name and service number 16/1033 carved into the wall underneath the town of Arras, 24 February 1917. Image courtesy of Brett Killington. In December 1916 Solomon and two other Cook Islanders who had recently recovered from illness were temporarily attached to the New Zealand Tunnelling Company, where conditions would be a little more bearable. 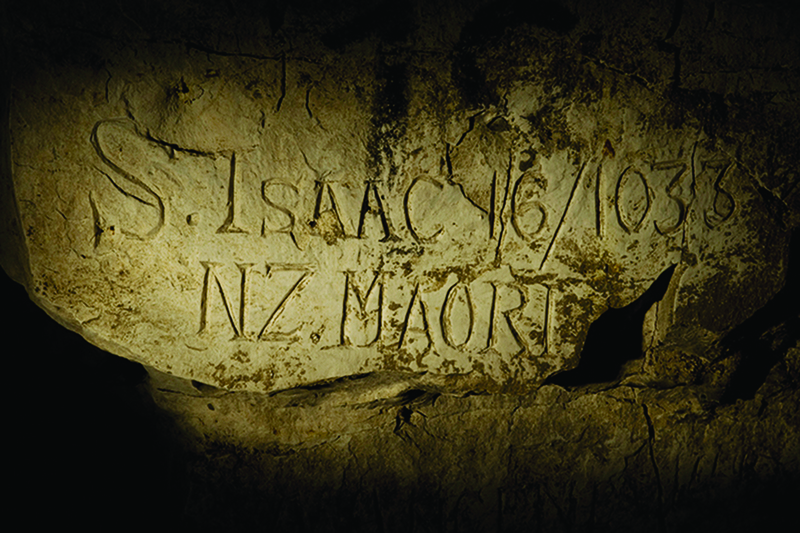 For nearly three months, Solomon helped dig an underground cavern system beneath the town of Arras, pausing to carve his name and service number onto a tunnel wall. Despite his weak health, in March 1917 Solomon returned to the Pioneers, serving for another 11 months. With respiratory illness still plaguing the Cook Islanders, in January 1918 they all left the Pioneer Battalion to join the Rarotongan Company in Palestine. Here Solomon unloaded and carried heavy ammunition to the front line, keeping stashes concealed from the enemy. Despite falling dangerously ill with pneumonia in mid-1918, Solomon survived the war. After Armistice, he sailed for New Zealand, and resided in Grey Lynn, Auckland, for several years before returning to Tautu. In August 1922 Solomon married 17-year-old Teremoana Tikiteina, who was taken with the former soldier’s charm. They welcomed son Solomona Solomona a year later. When his son was less than two months old, Solomon went fishing alone in a remote lagoon for seafood that would fortify his wife’s breast milk. There he stood on a stonefish. Though stonefish poisoning isn’t usually fatal, paddling and poling his canoe back to land exhausted him. Come evening, he was found struggling out of his canoe at the Tautu wharf, dying shortly afterwards on 3 September 1923, aged just 27. Solomon is buried alongside his parents between family homes in Tautu. A concrete headstone bears his name, the words ‘Great War Veteran’, the New Zealand Expeditionary Force cross and a silver fern. Solomon Isaacs’s story is featured in New Zealand Post’s commemorative stamp and coin programme, ‘1916 Courage and Commitment’. WW100 would like to thank New Zealand Post and Isaac Solomona for sharing Solomon’s story with us. 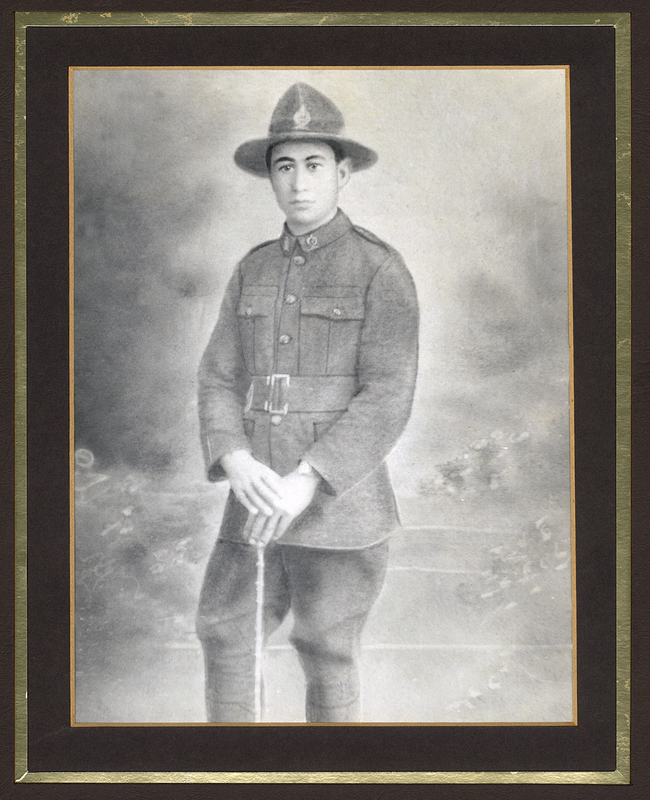 Isaac Solomona, who is Solomon Isaacs's grandson, began the physical and emotional journey of discovering his family connection to the First World War by asking questions about the uniformed soldier depicted in a portrait that hung in his childhood home. Watch an interview with Isaac Solomona on One News Now. 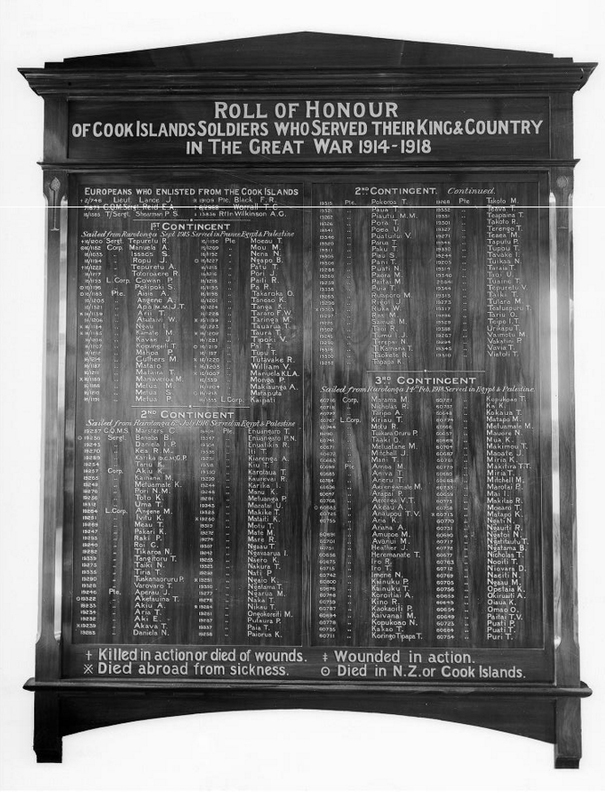 Roll of honour, listing First World War soldiers from the Cook Islands. Solomon Isaacs's name is the third name listed. Ref: 1/1-006732-G. Alexander Turnbull Library, Wellington, New Zealand.